Clarkii Clownfish are one of the larger clownfish species and are known for their hardiness. The body color of Clarkii Clownfish can vary according to the region of origin and can vary from yellow to brown to almost black. Fins are typically yellowish to orange. It has 3 vertical white body stripes. Sometimes the tail stripe can be so narrow that it looks like it only has two stripes. Clarkii Clownfish are highly adaptable and no other clownfish has a wider distribution in the wild. Furthermore, it is the only clownfish species observed in all of the 10 symbiotic sea anemones. Perhaps this adaptability is the reason why Clarkii Clownfish are so hardy and do exceptionally well in reef tanks. Clarkii Clownfish are the most widely distributed clownfish species and can be found in the Pacific Ocean west to the Arabian Gulf, east to Fiji, north to Japan and south to the subtropical regions of Australia’s Great Barrier Reef. 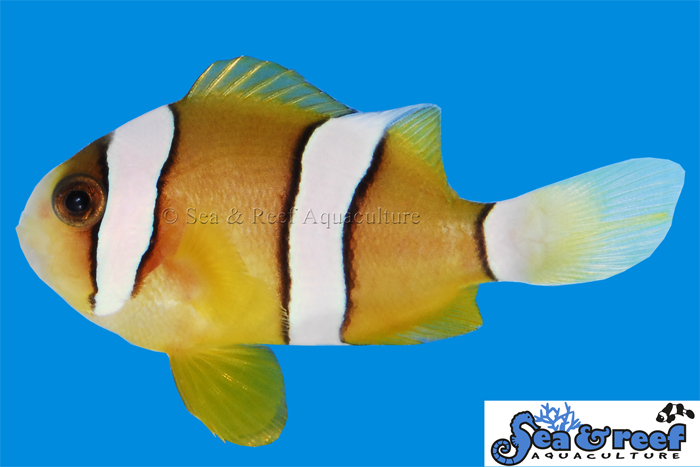 Clarkii Clownfish are known for their hardiness and is an excellent beginner’s choice for a reef aquarium. Its bold behavior can be an excellent quality in your reef tank because the fish displays well and can be very interactive. Clarkii Clownfish are strong swimmers and in the wild will often venture a fairly long distance away from its anemone. You can therefore expect to see this fish swim all over your tank even if an anemone is present. Clarkii Clownfish is an aggressive feeder. Most clownfish are omnivorous feeders, meaning that they will consume a variety of different food types. In nature the diet of clownfish consists of crustaceans (such as copepods and amphipods), algae, polychaete worms and leftovers from the anemone’s meal. Our captive bred fish are conditioned to eat a variety of aquarium diets including pellets, flake food, frozen Mysis shrimp, and frozen brine shrimp. In the wild, Clarkii Clownfish will host with all of the 10 known symbiotic anemones including the Bubble Tip Anemone (Entacmaea quadricolor),Beaded Anemone (Heteractis aurora), Sebae Anemone (Heteractis crispa), Magnificent Sea Anemone (Heteractis magnifica), Haddon’s Carpet Anemone (Stichodactyla haddoni), Giant Carpet Anemone (Stichodactyla gigantea), Merten's Carpet Anemone (Stichodactyla mertensii), Corkscrew Tentacle Anemone (Macrodactyla doreensis), Adhesive Anemone (Cryptodendrum adhaesivum) and Delicate Anemone (Heteractis malu). Clownfish do not require host anemones to survive or thrive. However, in most cases they will readily accept them. The Clarkii Clownfish is not picky when it comes to anemones and will readily host in a number of anemone in captivity. We recommend the hardy Bubble Tip Anemone (Entacmaea quadricolor).